Founded in 1965, SAFRAM is a Swiss-based European road transportation and storage company specialising in regulated chemicals. With a Europe-wide presence, SAFRAM is a value chain dedicated to customer satisfaction with a constantly evolving systematic “quality” approach to ensure the continual improvement of its infrastructures, network, and the storage, transportation and delivery stages. 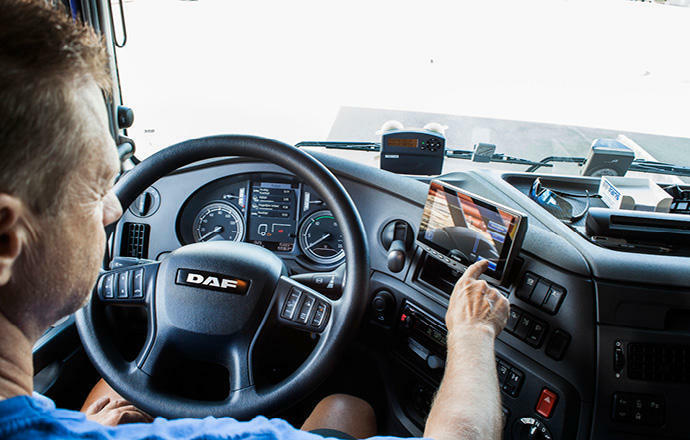 In order to enhance its business, again with the focus on customer satisfaction, SAFRAM FRANCE (formerly TRAFICTIR) chose to fit its entire fleet with the Trimble on-board IT solution. In June 2011, at a time when we were still TRAFICTIR, we chose Trimble to provide us with computerised solutions which could be adapted to our existing tools to give us a streamlined in-house IT so that we could computerise everything quickly. Choosing CarCube provided us with accurate tracking and effective traceability of our freight and lorries. SAFRAM has 200 lorries and plans to continue expanding its fleet. With this in mind, they chose the CarCube solution because it is a simple and effective all-in-one tool! “In fact, CarCube provides us with tracking and total management in a number of different situations, i.e. taking charge of vehicles, a GPS for the drivers, delivery tracking, etc. On the other hand, CarCube’s performance enables us to piggyback all of our existing IT tools easily, so that we can continue to deal with other complementary areas without having to change systems. Finally, another aspect we are extremely happy with is the document scanner, which enables us to send proof of delivery straight to our website for our customers. In addition, our drivers validate the compliance of deliveries and pick-ups on CarCube, i.e. waiting times, reservations, bundling, weight, pallet exchange, etc,” says Nicolas Korent. This saves a lot of time, not forgetting optimal information reporting in real time, which enables optimised communication with our operators and all of our customers. CarCube is a totally essential tool when it comes to driver safety and taking charge of the vehicle. The software is capable of providing full traceability of his journey, both during the daytime and at night. In addition, when he takes charge of the vehicle, the driver has to validate the overall condition, the consignment of the freight, his ADR equipment, transit documents, delivery note, etc. Thanks to the way CarCube is configured, the driver becomes fully responsible for his vehicle, so ensuring his own safety. CarCube enables the various calculations required to comply with the various regulations in accordance with the ADR, with full interactive capability between the drivers and head office. With an easy-to-use touch screen, interactive capability and integrated messaging, CarCube enables drivers to avoid phone calls and, consequently, provides comfortable safe driving at the wheel for each driver. We are very happy, not only with CarCube but also with the great relationships we have with the project manager and sales representative from Trimble, who are visible, efficient and responsive when it comes to all our questions and requests. SAFRAM is a European transport company of Swiss origin with 340 employees and a vehicle fleet of more than 200 trucks. SAFRAM operates throughout Europe with as main activity the transportation of hazardous products.